Iran tested its Emad ballistic missile this weekend in direct violation of UN resolutions prohibiting such activity. If America had sane, competent leadership, this would immediately kill the horrible Iran nuclear deal, but because we have Barack Obama and John Kerry in charge, Iran’s latest violation of international law will go ignored as usual and America will rush headlong into the worst, most dangerous agreement in our nation’s history. NOTE: Contrary to what the Reuters article linked below says, the Emad is NOT a precision guided weapon. 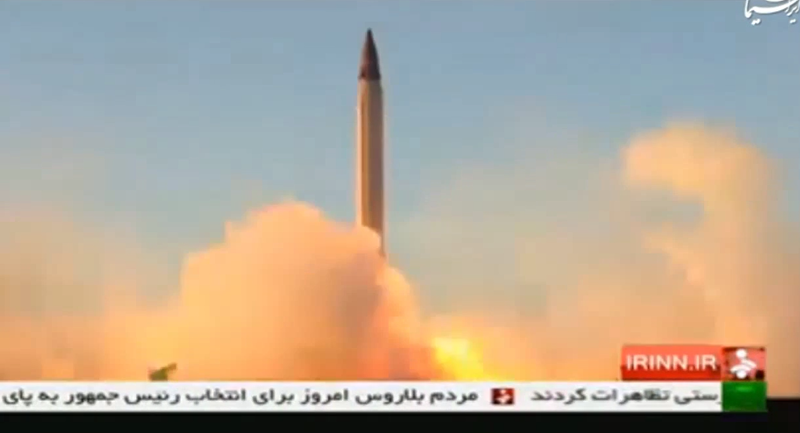 It is a ballistic missile that the Iranians are attempting to make more accurate. The Emad is an Intermediate Range Ballistic Missile (IRBM) with a range of just over 1500 miles. It has a payload of just under 4,000 pounds. It has nuclear warhead potential, as well as MIRV (multiple warhead) potential, in addition to being a primary testbed for improving the accuracy of Iran’s ballistic missiles. The Washington Free Beacon is reporting something that the so-called “mainstream” media has chosen to ignore, namely that the Iranians have pulled out of nuclear talks with the P5+1 nations after the US further tightened sanctions on the Islamic Republic, as had been planned for some time. It will be interesting to say the least to see if the Obama administration “blinks” in order to get the Iranians back to the negotiating table. Up to this point the Iranians have played the Obama administration like a fiddle in the negotiations. Other nations, most notably Red China and Russia, are already moving to ease sanctions on Iran based on the prior announcement of a deal with the Iranians, in return for which the Ayatollahs essentially gave up nothing of note. It is also very important to note that the $7 billion figure for sanctions relief being thrown around is just the tip of a politico-economic iceberg. Opening up Iran’s oil and gas exports will produce a bonanza many times that figure for the Ayatollahs. Anyone who says any different is either lying or ignorant. Iranian negotiators abruptly ended nuclear talks with Western powers in Vienna on Friday just a day after the Obama administration announced tighter sanctions on Tehran. Iran had threatened that new or tighter sanctions would nullify the recently reached Geneva interim deal, which is not yet in effect. However, Carney said that the administration continues to oppose new sanctions. “Let’s be clear also that we continue to oppose passage of new nuclear-related sanctions,” Carney said. Given Obama’s track record, it’s tough to know where the truth lies here. But either way, the news is bad. Either Obama lied and made an even worse deal with the Ayatollahs than he is telling us, or he is telling the truth and the Ayatollahs have already decided to re-interpret the agreement in such a way as to allow maximum overdrive in their continued quest for nuclear weapons. It doesn’t really matter which at this point because Obama already opened Pandora’s Box with this terrible agreement. The Ayatollahs have broken down decades of work by Republicans and Democrats alike in America to do our best to isolate Iran economically through sanctions. Perhaps even more than Obamacare, that will be Obama’s legacy: Atomic Ayatollahs–the world’s most active state sponsor of terrorism armed with nuclear weaponry. Thanks to Obama and his disgraced Secretary of State John Kerry, the Iranians will very soon have billions of additional dollars with which to develop nuclear technology, build ballistic missiles and sponsor Jihadist terrorism around the globe. Iranian officials say that the White House is misleading the public about the details of an interim nuclear agreement reached over the weekend in Geneva. The White House released a multi-page fact sheet containing details of the draft agreement shortly after the deal was announced. However, [an] Iranian foreign ministry official on Tuesday rejected the White House’s version of the deal as “invalid” and accused Washington of releasing a factually inaccurate primer that misleads the American public. Afkham and officials said that the White House has “modified” key details of the deal and released their own version of the agreement in the fact sheet. Iran’s right to enrich uranium, the key component in a nuclear weapon, is fully recognized under the draft released by Tehran. It is clear that Iran knows that uranium enrichment is key to its quest for nuclear weapons and they have every intention of continuing that activity. What is not being discussed in the so-called “mainstream” media in the US is the fact that Iran’s uranium enrichment operations are already in violation of UN Security Council Resolutions and the Nuclear Non-Proliferation Treaty, to which Iran is a party. Why does anyone think that the Ayatollahs would suddenly begin playing by the rules now? It is once again worth noting that we have seen this scenario before. Way back in 1994, in a deal referred to as the “Agreed Framework,” Bill Clinton and Jimmy Carter combined to forge a deal with North Korea that was supposed to prevent that country from building nuclear weapons. It failed. In fact, Jimmy Carter can rightly be referred to as the Father of the North Korean Atomic Bomb. North Korea took the largesse that that deal provided and kept up its work on building bombs. Clinton and Carter to this day continue to lie about what the Agreed Framework accomplished. What it actually accomplished was to provide the cover necessary for a rogue nation to become a nuclear power. It is significant that the Agreed Framework was fashioned in such a way as to avoid the necessity for Senate ratification. Today, the Obama-Kerry-Ayatollah agreement does the exact same thing. It bypasses the Senate’s constitutional authority and responsibility to ratify foreign treaties. And the inevitable result will be Iran as a nuclear power. This will be a gargantuan problem that successive presidents will have to deal with long after Obama steals away in the dark of night from his work at 1600 Pennsylvania Avenue.